We’re planning on having our annual Monarch Migration party on Oct. 1st this year. This is a full two weeks later than we had the program last year. If you look at the JourneyNorth.org website you’ll see that while the western population, central Y.S.) has headed down to Mexico ahead of time, the Eastern half is bunched up in the Northeast. Here’s a link for a weekly report. Here are some observations from the Peak Events of Journey North where the Monarchs were reported. Oct 2 – Temperature got down to 37 degrees last night! Oct 9/10 – I’m seeing 6 monarchs in the yard at a time – mainly on tropical milkweed. It’s interest to see on the Journey North website that there are still a lot of Monarchs in the NorthEast part of the country. Below is an amalgamation of twenty different letters of thanks from the kids. 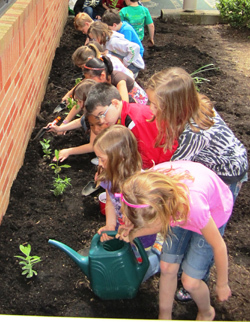 Thank you for giving Crestwood second graders good tips on making a terrific butterfly garden. Thanks to you are butterfly garden is turning out great! EVERYONE LOVES THE GARDEN !!!!! And the second graders love working on it. We also like water too! I really didn’t know that you had to tap the bottom of the plant box. Even if it is hard work on. It’s dirty and hot but we don’t care! How do you know so much with butterflies and plant? Because I think you are like the world’s best planter and butterfly exspert. I hope you like my letter. While I usually recommend May 1st as a safe date to plant outside, I also like to keep track of the last frost dates. Here are my notes. March 14, 2011 – 2″ snow on the ground – 32 degrees. Ulthoff Elementary – Judy S.